Block Print Fabric, Japanese Waves Pattern in Indigo Blue | Hand printed soft cotton fabric, Japanese block printed pattern of ocean waves. Forest Fabric, Crane Fabric | Japanese print fabric, bird fabric, tree fabric, red turquoise cotton fabric with cranes in snowy pine forest. 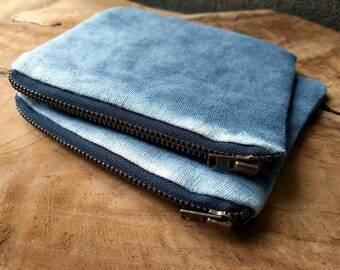 Organic Linen Pouch, Indigo Bag | Hand painted blue linen purse, YKK zipper pouch, boho coin purse in stonewashed linen. Announcement Original nature block prints inspired by Indian and Japanese pattern on natural cotton and linen fabric, accessories and gift packaging. Original nature block prints inspired by Indian and Japanese pattern on natural cotton and linen fabric, accessories and gift packaging. Block Print Fabric, Indigo Botanical Fabric | Hand block printed plant fabric, leaf pattern fabric, indigo blue leaf print on grey cotton. 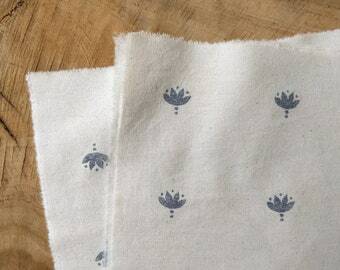 Block Print Fabric, Plant Stems in Grey and White | Botanical print cotton, hand printed leaf pattern fabric, block printed plant fabric. Grey and Blue Block Print Fabric | Indian lotus flowers hand printed in indigo blue on grey cotton, block printed modern, Indian floral. Block Print Fabric, Japanese Wave Fabric in Basalt Grey | Grey block print cotton, neutral hand printed fabric with Japanese pattern. 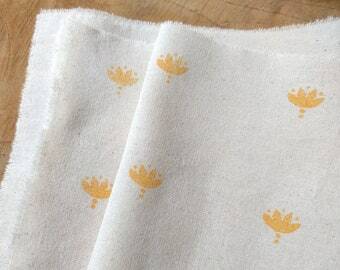 Block print fabric in gold yellow on natural cotton, hand printed Indian lotus flowers, yellow flower print on unbleached cotton fabric. 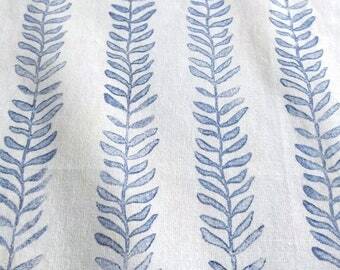 Block Print Fabric, Indigo Botanical Fabric | Hand block printed plant fabric, leaf pattern fabric, indigo blue leaf print on white cotton. 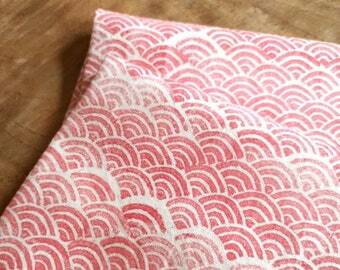 Block Print Fabric, Japanese Waves Pattern in Natural Red | Hand printed soft cotton fabric, Japanese block printed Seigaiha pattern. Block print fabric in indigo blue on natural cotton, hand block print Indian lotus, dark blue flower print on neutral unbleached cotton. Blue Bird Fabric, Hand Printed Fabric | Block print fabric, turquoise bird print, blue and white fabric, block printed cotton, quilt fabric. Garden Block Print Fabric, Green and White Cotton | Block printed plant fabric, botanical fabric, sage green fabric, leaf pattern fabric. Blue Botanical Cotton, Block Print Fabric | Leaf pattern fabric, block printed nature fabric, leaves botanical print in turquoise blue. Listing for Valery - 80 Kraft Paper Tags | Kraft tags, price tags, brown craft paper hang tags for packaging, gift labels. Forest Fabric, Crane Fabric | Indigo Japanese print fabric, bird fabric, tree fabric, pine forest with cranes and snow on cotton fabric. Organic Linen Fabric, Gold Boho Indian Print | Soft, stonewashed linen with yellow block print design, digital print on natural white linen. The waves pattern in fresh basalt grey is back in stock! Forest & Sea | Original nature prints on natural cotton and linen fabric, accessories and homeware. Digitally and hand printed cloth from Forest & Sea. One of a kind bags and pouches made from hand dyed linen. Forest & Sea | Woodblock prints hanging to dry. Natural prints on Etsy by Forest & Sea. Hi! Welcome to the Forest & Sea Etsy shop! Here you can find tactile and useful handmade things with original prints based on the natural world: an infinite source of beautiful inspiration! I picked pears in Holland, managed an épicerie in the Alps and spent summers as a campsite receptionist in southern France before buying an old house here in Bruges. I studied art at UCA in England and love printing nature on natural materials! Can I have my order sent with tracking and insurance? Yes! All orders are sent with priority post and are carefully packaged to ensure they arrive with you safely and in perfect condition. If you'd like tracking on your package or tracking with insurance, just select them from the drop down menu at checkout. Yes! Forest & Sea ships to every country in the world! Tell me more about Forest & Sea! * Here in the Forest & Sea shop, you will find tactile and useful handmade things with original prints based on the natural world: an infinite source of beautiful inspiration! * Forest & Sea items are handmade by me in the medieval city of Bruges, Belgium and ship all around the world! * I love working with natural materials and make sure Forest & Sea products have a minimal impact on the environment. * I use environmentally friendly, water based inks, dyes and paints. * All artwork, images and content are © copyright so please don't reproduce without permission. Copyright does not transfer with the sale of an item. * Check back regularly: I'm always working on something new!